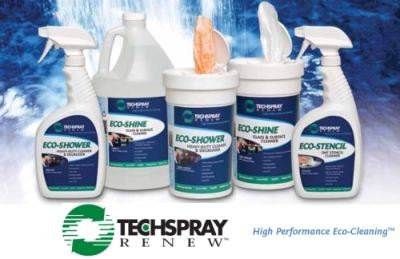 TECHSPRAY RENEW™ branded cleaners are innovative solutions that combine the best of current “green” technologies to make the most powerful green cleaners on the market. Techspray® has applied over 30 years experience in solvent cleaning to formulate products that meet regulatory standards with major ecological advantages, but no performance trade-offs. TECHSPRAY RENEW™ products are designed through close coordination with end-users, ensuring that first and foremost, the products have superior performance. Performance is our top priority, using the best “green” solutions as they become available. TECHSPRAY RENEW™ products have low VOCs, a major component of smog, and have no global warming impact. This helps your facility to comply with local, state, and federal environmental restrictions. Instead of engineered solvents, we use corn-based ethanol, seed oils, soy-based oils, citrus-based oils, and other natural, sustainable ingredients. Most packaging is easily recyclable and, when feasible, made of recycled materials. Compliant with CARB (California Air Review Board), European REACH (Registration, Evaluation, Authorization & Restriction of Chemicals) and WEEE (Waste Electrical and Electronic Equipment Directive). These products do not contain RoHS (Restriction of Hazardous Substances) restricted substances, SVHC (Substances of Very High Concern) listed substances, or halides. Powerful…Green…and Specially Priced right now!